Chronicling the War of 1812 and other forgotten or obscure history. I'm working on a war game for War of 1812 miniatures. I wanted to create a variant of Battlecry! (the Command and Colors system), keeping the fun and fast playing aspects of the board game intact, while introducing deeper rules that will be more historically satisfying. I'll post the entire rules set here later, but the basic idea of this variant is to take advantage of the modular game components of the published set and convert them for War of 1812 company-level tactics. The War of 1812 was a small-scale war compared to the Napoleonic Wars in Europe. But it used the same formations, weapons and tactics. The building blocks of the armies were companies (and war bands, for the North American Indians who fought). There were tactical formations called platoons and squads (down even to a single "file" of two or three men) but I have rarely if ever seen them used in real life accounts. Generally, the basic unit was the infantry company (which could be "light" "line" or "grenadier" although these distinctions didn't exist in the US Army at the time) of 30-120 men. Disease, desertion and non-re-enlistments plagued the regular companies and they could dwindle in strength quite fast. Therefore the rules I've created make for a battle game where each player controls a number of different companies (and single artillery pieces) fighting for various objectives. The original rules measure victory by how many of the opposing units each player destroys ("capturing" their flags). My variant incorporates a variety of different objectives depending on the scenario, such as seizing a certain point on the field, delaying an enemy advance, etc. Companies in the American service were generally called after their captain. If they had any other designation it was as a number (probably from the right of the regimental line; also usually based on seniority of the captain)-- the alphabetic designation for companies wasn't introduced until the 1820s. Likewise there were no official "flank" companies in the US Army, but unofficially some colonels designated their two best companies as "light" troops. "Light" infantry fanned out in open order to screen the rest of the regiment, acting as scouts and flankers. The British, by contrast, established two elite flanker companies for each combat battalion. However, even the generic line companies might fight as light troops in some circumstances, and a battle-hardened line (fusilier) company might have better skills than a newly arrived light company. One reason why the Americans did not officially establish flank companies, though, is that they based their organization and training off that of the French Army. Napoleon's regiments did incorporate elite companies, but only did so once a regiment had proven itself in battle-- so that the best officers and infantrymen in each battalion could be identified. Another difference between continental tactics and North American ones was the battalion. Several of the American regiments were supposed to have two combat battalions, but in general each regiment was synonymous with a single battalion. At various times in the war several decimated regiments were incorporated to form a single battalion. In general it's best to say that the second tier of tactical organization was the battalion of several companies (the drill manuals said ten companies, but many field units designated as battalions only had three or four companies). In this game, each player functions as a battalion or brigade commander. Instead of depending on a card-drawing mechanism to determine what you can do each turn, I assume that each company unit is able to act on its own to the extent of fighting and following orders. The lack of a "orders" system like some war games have gives up the "fog and friction of war" but makes the game considerably more streamlined and rational. Again, in real life we can assume that each company commander was competent enough to order his men to fight an enemy in front of him, and it didn't take too long for a battalion commander to get orders to individual companies. More than two players can join the game, simply by giving the extra player control of a different faction or group of companies on the field (like the Indians, or mounted soldiers). They can form a team or compete with each other for different objectives (like Tecumseh and General Henry Procter sometimes did). Each unit represents a company or band of soldiers (or 1-2 cannon). These consist of one miniature or card that identifies the type of unit, on top of a stack of poker chips. The top (blue or red depending on which side) chips represent morale. Morale determines the combat efficiency of a unit and is a combination of such intangibles as mood, training, experience, fatigue etc. Ranged combat outcomes are based on morale, not strength. The white chips represent strength, roughly 10-12 men per chip. A firing unit cannot cause more strength losses in a target unit than it itself possesses... but it can cause more than one hit. This keeps relatively big single strength units like heavy artillery from wreaking havoc from a great distance, and small units from using a JFK style--"magic bullet" on a numerically larger foe (See below). Combat is settled by rolling the Battlecry! dice, which have icons of a infantryman, a horseman, a pair of sabres, a flag, and a cannon. In the original rules, each icon only "hits" when the unit type is rolled. 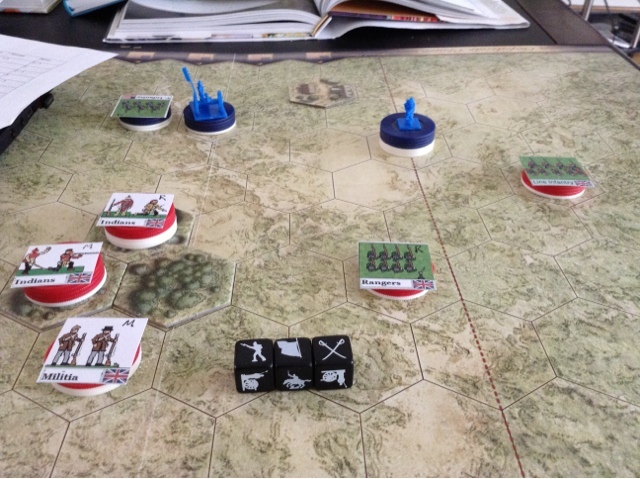 For each flag rolled, the defending unit has to retreat one hex, and sabres are wild cards which hit any unit. The number of dice rolled depends on the number of figures in the firing unit and the range or distance it stands from the target. The three different units: foot, horse, and cannon, have different ranges. My version of the rules uses the original dice-- each infantryman causes a strength hit (limited by number of firing units), etc. Flags are still used for retreats. However, the sabres take morale points rather than strength points from the target. If a unit loses all its morale it must retreat to the friendly edge of the board (leapfrogging any friendly unit that blocks its escape). If a unit suffers 100% casualties it is considered destroyed and placed on the opposing player's side of the board as a trophy. If any retreating unit is trapped by surrounding hostiles, it is considered destroyed as well. The modifiers subtract from the base morale of a unit. In addition, terrain features and leaders might confer or detract points from a unit's firing stats. You may notice that rifles suffer a -1 penalty at close range. This is meant to reflect the disadvantages rifles had for close range fighting: the long rifle and 1803 Harper's Ferry were not as sturdy, had no bayonets, took about three times as long to reload, and shot a smaller ball than the smooth bores. Pistol and Sabre gives units that were truly equipped as light dragoons a way to attack... but most American mounted units in the west were equipped with rifles or muskets anyway. Howitzers fire "bombs" which have a certain sweet spot of greatest efficiency... but they could also fire canister or solid shot at close range. If you don't have the Battlecry! or another Command and Colors set, you can simply substitute rolls 1-2 for infantry, 3, 4, 5, 6 for the other results on 1-4 six-sided dice. I don't have a system for close combat yet: aside from trading devastating volleys at close range, a unit advancing on another one can choose to force it out of its hex (a "bayonet charge") if it simply has a higher combined strength and morale. This is meant to reflect the fact that a well-organized unit could simply walk through a less organized one, and that melee-style close combat occurred only rarely, compared to fire fights at 25-50 yards range. I've designed these rules with a youth program in mind, so that the complexity and size of a battle can be dialed up or down depending on the age and gaming experience of the participants. I'll be trying to playtest the game as much as possible. What I hope to accomplish is to create a game that is both educational and fun on a beer-and-pretzels level, with enough flavor to make it feel like 1812 combat while abstract enough to learn and play quickly and easily. Why did the American army adapt the French army instead of the British one? Is it because they were wowed by Napoleon's tactics with them? Also, another funny thing you should add to the game, a random roll in where soldiers tries to avoid service and runs off, and then you can choose to use next turn to capture and punish them, or just let them go. I'd be happy to test your game as a completely amateur with no idea what the hell is going on. I'm sure you could probably drag Amie into it as well. Everyone during the Napoleonic period, except for the British, adopted the French tactics that had proven so successful in the past decade. American officers translated the French book of tactics to move their troops on the field. They were much better suited to a new army like the Americans than the British tactics.